with the amount of traffic that passes through the nation’s toll booths it’s no wonder that the dirt, oils, exhaust and grime that accumulates on them seems insurmountable. But cleaning a toll plaza isn’t as easy as grabbing some soap and a sponge. It requires the right equipment and coordination to complete the project properly without affecting traffic flow. 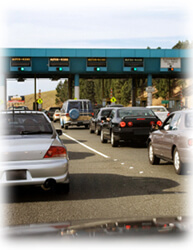 The first step in cleaning a toll plaza is to determine which areas of the plaza are to be cleaned. Heavy traffic and exhaust fumes accumulate on the pavement, canopy, crash barriers, and toll booths. Cleaning services that are contracted to clean the toll booths will also clean a portion of the pavement leading up to the booth. Given the amount of work that needs to be done in high traffic areas it’s only logical that the work is performed during off hours, usually 12 midnight to 5 AM. All told, cleaning approximately 11,000 square feet of toll booth and pavement should take 2 days. Using the proper equipment and cleaning agents is also crucial to cleaning a toll plaza. A trailer mounted pressure washer with a PSI of 3000 and a flow rate of 4 or 5 GPM is an ideal choice to tackle a job of this size. Using surface cleaner attachments for the pressure washer in conjunction with degreasing agents will yield impressive results when it comes to removing dirt and oil. The biggest challenge is making sure that you have enough water to effectively clean the toll plaza. A tank with a capacity of 750 gallons or more is an ideal choice for cleaning a toll plaza. Although the lighting under the toll canopy is usually good, a generator and portable lights will be required to effectively clean the paved area before the toll booths. When it comes to the actually cleaning a toll plaza it’s not as cut and dry as starting up the pressure washer and blasting away. Toll plaza’s have a substantial amount of loose gravel and debris which needs to be cleared in order for the pressure washer to be effective. A gas powered leaf blower will make quick work of the loose gravel by pushing it out of the way of the cleaning area. A crew of several people is required in order to complete the project within two nights. Usually one worker will clean the underside of the canopy with a telescoping wand while another will use a hand-held wand to perform the detail work in and around the toll booths. Two more workers will operate a surface cleaner and another hand-held wand to push water towards the drainage area. The work involved in cleaning a toll plaza is quite extensive and requires a good deal of coordination between several agencies. But with the right equipment and cleaning methods, a regular contract for cleaning toll plazas can be a lucrative endeavor for any business. As with any project, hard work and good planning will lead to a successful job.